DCIS (or ductal carcinoma in situ) means that malignant cancer cells have been found in the area of the duct wall, but still at an early stage and with no infiltration. One treatment option for DCIS may be to surgically remove the entire mass (lumpectomy). This is a particularly good treatment strategy when the mass is very small (less than 15 mm) and when the histological grade is still considered low or intermediate. 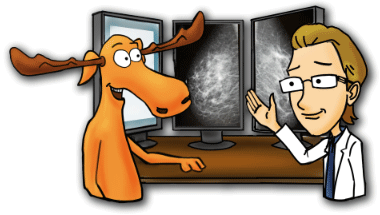 This page is still very useful, however, I have created a newer version of this page with more up-to-date information on DCIS and it’s recurrence. When a surgeon cuts around a tumor, he/she feels the lump and passes the scalpel somewhere outside the edge of the lump, cutting through the normal tissue. It is considered disadvantageous when this strip of normal tissue around the tumor is very narrow. A larger resection margin would mean that the scalpel cut was further away from tumor cells. When this margin is greater than 10 mm, the risk of recurrence of DCIS is greatly reduced, but when it is very small, often less than 1 mm, the risk of recurrence is quite high. Local recurrence of DCIS where the lesion is small, the resection margin large, and the histological type low to intermediate, can be as rare as 0.3 %. The surgeon has to make a reasonable decision as to how much of a margin to take. He wants to be absolutely sure that all malignant tumor cells have been removed. This is weighed against the perceived aggressiveness of the carcinoma based on histological and mammogram findings, and also the personal concerns of the patient. Generally speaking, surgical interventions for breast cancer endeavor to disturb the surrounding tissues as little as possible, while still making sure they ‘get all of it‘. But as a tumor grows in size, the amount of tissue available for a larger resection margin is reduced. When the lesion is large (greater than 40 mm), the resection margin smaller than 1 mm, and the histological grade high, the chance of local DCIS recurrence is quite high; up to 60%. The pathologist will typically test the removed tumor specimen to see if malignant cells are found on the outside. A ‘positive margin‘ means that tumor cells have indeed been found along the cut edge of the removed mass. This would indicate that the surgical margin was not wide enough, and will likely have to be redone. Other related terms in conventional use now are ‘close margin‘, and ‘negative margin‘. A close margin is a clean layer of tissue less than 2 mm, and a ‘negative‘ margin is anything greater than 2 mm, although as we have seen, the larger the margin the better. Margins are presently evaluated microscopically from tissue samples, though there is a movement toward using optical coherence tomography in some breast cancer treatment centers, with a view to improving surgical accuracy. Women with positive margins tend to fare worse than those without, regardless of radiation or chemotherapy, although there appears to be lack of consensus on that issue. Many oncologists still feel that postoperative radiation therapy is beneficial for women with positive and close tumor margins. If surgery must be performed again due to a positive margin, the rate of recurrence for DCIS is thought to be around 42% (58% for invasive breast cancer). So, while the odds for malignant carcinoma recurring in positive margins is around 50%, the overall rate for recurring malignant carcinoma on any lumpectomy is between 3% and 4% for DCIS and 10% and 11% for invasive cancers, regardless of the initial margin status. For further reading, I suggest you visit this page on DCIS, go to this page for detecting DCIS and the importance of finding malignant microcalcifications, and this page to know about the types and grading of DCIS. 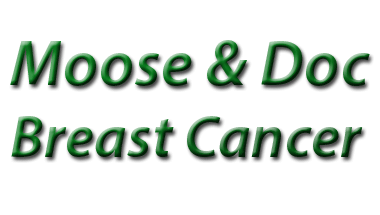 Brown C, Mew D, Care of Breast Cancer Patients in Family Practice, The Canadian Journal of Continuing Medical Education, October 2001, Vol 13, no 10. p123-134. Meric F, Mirza NQ, Vlastos G, Buchholz TA, Kuerer HM, Babiera GV, Singletary SE, Ross MI, Ames FC, Feig BW, Krishnamurthy S, Perkins GH, McNeese MD, Strom EA, Valero V, Hunt KK. Positive surgical margins and ipsilateral breast tumor recurrence predict disease-specific survival after breast-conserving therapy. Cancer.(Feb. 2003);97(4):926-33. Sheikh F, Pockaj B, Wasif N, Dueck A, Gray RJ. Positive margins after breast-conserving therapy: localization technique or tumor biology? Am J Surg. (May 2011).